PremiumSportsCenter: DOUBLE AWARDS: VAN PERSIE NAMED FOOTBALL WRITERS' ASSOCIATION PLAYER OF THE YEAR. DOUBLE AWARDS: VAN PERSIE NAMED FOOTBALL WRITERS' ASSOCIATION PLAYER OF THE YEAR. 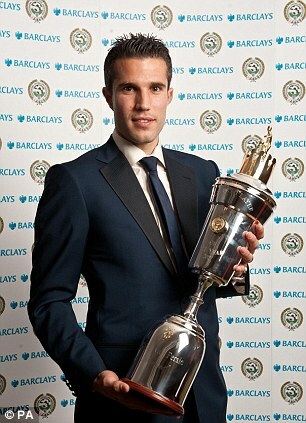 Robin van Persie has completed a double success by being named Football Writers' Association Player of the Year. The Arsenal striker was named PFA Footballer of the Year on Sunday and he has now followed it up with another triumph. Van Persie, 28, topped the poll of journalists with a landslide victory ahead of Manchester United forward Wayne Rooney in second place and his Old Trafford team-mate Paul Scholes third, with Fulham's Clint Dempsey fourth. Van Persie's 34 goals in all competitions has helped propel the Gunners into the top four of the Barclays Premier League, leaving them on the brink of Champions League qualification for next season. He is the third Dutchman to win the prestigious honour after former team-mate Dennis Bergkamp and Frans Thijssen of Ipswich. Van Persie who last was week named the Professional Footballers' Association Player of the Year, will receive the prestigious FWA accolade, which has been running since 1948, at a gala dinner at the Lancaster London Hotel.